← Get to Know Your West Hollywood Dentist, Dr. Ghiam! L.A. 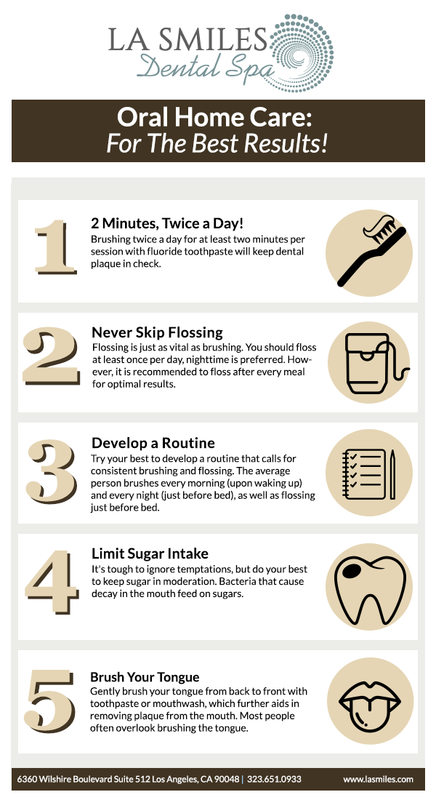 Smiles Dental Spa has proudly developed an infographic that outlines everything you need to know regarding the best practices to follow at home. Oral hygiene should always stay consistent at home when you are not visiting the dentist. In fact, the simple act of brushing & flossing everyday will go a long way in keeping your teeth healthy. This entry was posted in West Hollywood Dentist and tagged dental infographic, oral health infographic, oral home care infographic, oral home care tips. Bookmark the permalink. Why We’re Thankful for Cosmetic Dentistry! Should I Use Mouthwash: Yay or Nay?